Within those programs, we offer two majors and six minors. Majors and minors can focus in one area or design a broad-based course of study. Many of our courses are ACE-certified. Many students can easily add a major or minor in Ethnic Studies to their course of study. We offer minors in African and African-American Studies. These comparative, interdisciplinary programs address socio-historical, cultural, and political issues relating to African-Americans and Africans. Many of our faculty have strong interests in African-American and African issues and are very active in advising, teaching, researching and developing work concerning African-Americans, Africans, and the African diaspora. These programs are growing rapidly, with ever-increasing faculty appointments, new courses, and expanded programs and outreach projects. This program annually sponsors or cosponsors a variety of activities focusing on the experiences of African-American and African peoples. Students who minor in African-American Studies will study African-American culture, life, and history in the United States, as well as the African experience on the continent and/or in the Diaspora. A minor in African Studies will also contribute to a student's understanding of the diverse peoples and cultures of Africa and, ultimately, to a better understanding of his or her own society. Courses in other departments and colleges can contribute to the requirements for a minor in African-American Studies or African Studies. Students will find the minor beneficial if they plan to work in law, health and social services, education, business and industry, program development, or government. The Latino and Latin American Studies program (LLAS) was formed in 1993 when the Latin American Studies and Chicano Studies programs merged. The Latin American Studies major and minor offer an opportunity for students to gain knowledge about the peoples, languages and cultures of Latin America. The U.S. Latina/Latino Studies minor focuses on Chicanos/Latinos in the U.S.
Our faculty are leading researchers and teachers who are experts on Latin American and Latino issues and heavily involved in advising and community issues. 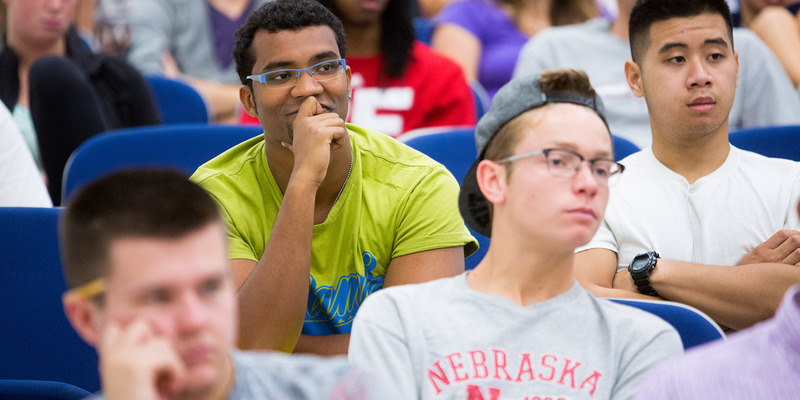 Our program is constantly growing with new course offerings and scholarly opportunities. The program provides a basis for students who intend to seek employment with government agencies and private enterprises with operations in Latin America, as well as students who plan to undertake graduate study with an emphasis in this region. Opportunities for majors are found in U.S. banks and commercial firms with Latin American branch offices, the travel industry, publishing companies, research organizations, and U.S. governmental agencies such as the Department of State, Agency for International Development, and U.S. Information Agency. Native American Studies provides a multi-disciplinary study of indigenous peoples of the Western Hemisphere with a focus on tribal cultures of the Great Plains. Our courses are taught from a Native perspective, with a special emphasis on fostering an understanding of Native belief systems, post-contact histories, oral traditions, social and political organizations, literary and artistic accomplishments, as well as contemporary issues. Our program, through its classes for the minor and an individualized major in Native American Studies, permits students to take a broad range of courses in a number of disciplines. For example, a student obtaining a minor or major in Native American Studies can take courses in Anthropology, English, History, Psychology, Art, and education, as well as courses that relate to Agriculture or Business. Students may also choose to gain first-hand knowledge of American Indigenous life and activities through our internship program. The Native American Studies Program sponsors and cosponsors various lectures that bring Indigenous leaders, scholars, and artists to the campus. Along with these invited scholars, members of our faculty also offer public lectures on a variety of topics, such as: legal aspects of resource management, environmental justice, sovereignty, sacred sites, religious freedom, gaming, the Indian Health Care System, federal policies, colonial history, depopulation, dispossession of land, subtle and not so subtle racism, education, and bison management programs. The university is home to several organizations that contribute to an understanding of Indigenous issues and lifestyles. The Native American Public Broadcasting Consortium, headquartered in Lincoln, and the University of Nebraska Press is known nationally and internationally for their productions and publications on Native American subjects. The Lincoln Indian Center, Inc. is one of the oldest such centers in the United States. It provides students with a cultural center and service/internship opportunities. Along with other resources, these organizations provide opportunities for students to further their knowledge about Indigenous Peoples, who contribute to America's special cultural profile.